Remember to properly label your librarian. 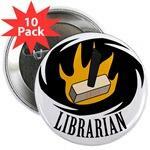 New librarian buttons and magnets at the Cafepress store. I got a Why You Should Fall to Your Knees and Worship a Librarian schlock transportation device AND a Librarian Avengers lunchbox as BIRTHDAY GIFTS! Click and send the site. If money can’t buy happiness I guess I’ll have ro rent it. Y’know after I wrote that I thought about it and wanted to revoke my complaint. You didn’t have to change your price. And in thinking about other speciality gear I’ve seen $15.99 isn’t bad really. I apologize for being a a pip. Now that I’m not a poor library school student either I can splurge on cool stuff if I want to – right! One of my friends back home runs librariangear.com (mostly T’s, but moving towards an underwear line – honestly, who doesn’t want a “librarians have tighter buns” pair of shorts? He tells me the boy jockeys for girls are a big hit.) It’s a good promotion of all things library – recently they provided the uniforms for the Vancouver Public Library softball team. Glad to see you are doing something similar to promote librarianship, as well as create some funding for some important groups. Best of success with it! I try not to charge more than 1-5 bucks more than the base price. I desperately appreciate everyone who buys schlock. I give some of the profits to groups like 826 Valencia, Glen Highland Farm dog rescue, and Women for Women International. The rest goes to my mortgage fund, depending on how bad a month it is. You’re stuff’s great – as it has been for years. What stops me from making a purchase? $15.99 for a mouse pad! ?